Insulating your home or workspace can be one of the most effective ways to cut your energy bills this winter, and at Sprayseal we work for both home and business consumers. Our experience in the sector and ability to offer services across the entire UK has made us one of the leading roofing insulation companies in the country. On all projects we use the latest spray foam insulation technology. This type of insulation helps control airflow within a building and provides a warm environment in the winter. The barriers created by our insulation also help keep your home cool during those hot summer months. Before we apply our insulation we also take the time to carry out remedial repairs on your roof. This helps ensure that you get the most from your roof insulation. Over the last 29 years we have worked on a variety of exciting and challenging projects. We are often bought in by local councils to work on listed buildings and in 1993 we were awarded a contract to renovate over 100 council houses by a Scottish District council. The flexibility of our roof and home insulation means we can work with a variety of building types including warehouses, car parks, loft spaces and storage buildings. You can also view our industrial and home insulation case studies and see some of the projects we have worked on. At Sprayseal our approach is to cause as little disruption to your home or business as possible. 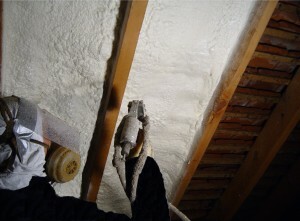 Projects typically take between 1 and 2 days and our home insulation contains no toxic fibres. We work with our clients to achieve the best possible results. You can also see how our roof insulation works by viewing our new insulation video. If you would like more information or to book our insulation service then please request a quote. One of our representatives will then give you a call and discuss some options with you. Alternatively, for some light reading about the benefits and technicalities of insulation head over to our articles section. Duratherm by our materials supplier Isothane Ltd.